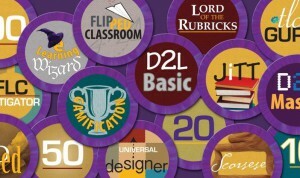 Learn how you can engage & motivate your learners by giving them badges & certificates within D2L. These achievement badges are little rewards and recognition that learners can earn for finishing tasks or mastering skills. The basic idea is to break down larger tasks into smaller achievements that allow for scaffolding of the learning and create a sense of pride at the same time. These badges also allow feedback to occur in smaller increments, providing a greater number of opportunities for success. The awards tool should be used to show achievements in a course not just used in place of grades. If you would like to find out more about the awards tool and ways to use it in your course contact us or attend one of our training sessions.